Osamu Namba's goal for Subaru: "Broaden the appeal to make it accessible to more than a small, loyal crowd." TOKYO -- When Subaru arrived in the United States in the 1960s, ads used the unflattering slogan "cheap and ugly." The brand has come a long way. But to critics, the concept of "Subaru styling" is still an oxymoron. Even loyalists describe it as "quirky"; the less charitable choose "bland" and "boxy." Subaru is one of the few brands that have been unscathed, even growing stronger, during the U.S. recession -- and now it wants to build on its success. The company finally is getting serious about design, its Achilles' heel, and is turning to an outsider as the new point man. Osamu Namba joined Subaru in 2008, hired from an independent styling studio he had founded a decade earlier. His mission is to unify the Subaru look across models and win new fans. "We want to broaden the appeal to make it accessible to more than a small, loyal crowd," Namba, 54, said last month in an interview at the Tokyo headquarters of Fuji Heavy Industries Ltd., Subaru's parent company. "We need to add a more contemporary element." Styling long played second fiddle to the Subaru brand's engineering must-haves: all-wheel drive, horizontal boxer engine and a functional interior. Traditionally, the Subaru boxer engine's horizontally aligned pistons make for a low front profile. But they also lend the car a lower center of gravity, making it more agile. Tall roofs, meanwhile, offer plenty of cargo space for all the outdoor gear that Subaru fans tote around, while aiding visibility. Performance came first -- and if the car looked funny, so be it. Previous attempts to improve design sometimes fell spectacularly flat -- most notably the widely panned, aircraft-inspired "propeller" grille of the mid-2000s. Whatever the weaknesses, Subaru's looks haven't hurt business. U.S. sales were up 35 percent through June, making it the No. 2 gainer behind Buick. It is on track for its second straight year of record sales and is adding capacity at its sole U.S. factory in Indiana to meet demand. But executives and dealers say sales could do better still with a more eye-catching lineup. "They had the engineering down," says Ernie Boch Jr., owner of one of Subaru's two independent U.S. distributorships. "Design was the final frontier. It's absolutely crucial." Namba's creations for Subaru have yet to hit the street. But his Hybrid Tourer Concept, designed for the 2009 Tokyo motor show, foreshadows the clean lines and bold look he is seeking. His first production design will be the Impreza, which was last overhauled in 2007. The company won't say when the next Impreza will arrive. Namba cut his teeth as a designer at Suzuki Motor Corp. straight out of college in 1979. Early works included the first-generation Wagon R, a minicar that today is among the best-selling vehicles in Japan. 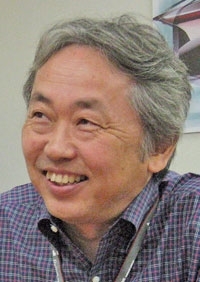 In 1994, Namba left to form his own design studio, HUB Design Engineering Ltd., where he consulted for Subaru and rival Japanese and Korean brands. HUB is not doing any business currently. Two years ago, Naoto Muto, then Subaru's head of product planning, recruited Namba to troubleshoot design. One chief complaint was that the models were stronger than the brand, Namba recalls. Subaru was already on its way to unifying its design language with what became the latest overhauls of the Legacy sedan and Outback wagon. Namba says he will build on that, with a couple of tweaks. -- A stronger overall presence for the cars. -- More pronounced, sculpted front fascia. -- Broader, more defined bumpers. -- A stronger side accent line, positioned lower on the body. Namba says he will approach the packaging of the upcoming Impreza with a keen eye for whether it should be bigger. Previous versions of the Forester crossover and Legacy were too small for the United States, a problem resolved only with their latest upgrades, he notes. Also, look for the Impreza sedan to shed its soft, rounded silhouette in favor of something stronger. "We have to show the function through design with simple, clean lines," says Namba, who counts the compact, no-frills Renault 5 -- remembered in the United States as American Motors' Le Car -- among his all-time favorite rides. "I want a very simple design that exhibits strength." Subaru needs to be more responsive to market trends but not slavish to them, he says. Namba decries the styling of some European brands as too busy with flourishes that perform no function. Design watchers say Subaru is making improvements but still has a long way to go. "Subaru has too long been heading in the wrong direction and become too focused on confused brand development," says Kuni Ito, an automotive design instructor at the College for Creative Studies in Detroit. But aiming for a futuristic, market-driven look again might be off the mark, he says. "Subaru users want a unique, almost cult, design, not a clean design like the Hybrid Tourer Concept," Ito says. The goal should be a timeless look that better embodies functionality, he said. Subaru bets existing fans will stay true. "It won't alienate the core because they appreciate that it's an evolution, not a revolution," Boch says. "The hard-core fans will keep buying it even if it's ugly. It's an added plus if it looks good." And that encapsulates Namba's challenge: Sticking to Subaru's roots while casting a wider net that keeps fueling the momentum of one of North America's hottest-selling brands. "I don't want it to be just something serious and boring," Namba says. "A lot of people don't know that Subaru brand. If we can make styling more accessible, it will bring them in."